I’m sure everyone reading this knows by now that 23andMe has been ordered to stop marketing their DNA test until they comply with previous FDA requirements. I wrote about this earlier. Forbes and several others have weighed in too. The Forbes article is particularly interesting because it is written by Matthew Herper who has covered the FDA for 13 years, so has significant perspective. Since that time, a firestorm of questions, comments and emotions have been forthcoming, from all directions. As consumers, we feel trapped, caught in the middle of a battle, along with our DNA and results. And sadly, it looks like the battle didn’t have to occur, had 23andMe not ignored the FDA for months after promising results it never delivered. I want to make a couple of comments, then talk about what we, as consumers, can do to prepare for the worst case. But before I do that, I want to make it very clear that I don’t expect that the worst case scenario will happen. What would that be? 23andMe going out of business. I don’t think that will happen. Even though they, according to the FDA letter, have been negligent in taking care of business and meeting their commitments, they have bright minds and deep pockets….and 15 days to make some sort of conciliatory peace with the FDA. Now I’m not a psychic, but I’m betting that 23andMe headquarters is very busily figuring out all of the things they need to do to put this ugly public chapter behind them. Of course, I could be wrong. This could be the death knell for 23andMe. But I don’t think so, unless they cannot prove the accuracy of their product or they continue to ignore the FDA and fail to meet commitments. Most of the questions and concerns voiced today by consumers revolve around what will happen to results they already have on the 23andMe website. There is no reason to think that the results would be removed as long as the website is functional. And their website is their link with the world, so as long as there is 23andMe, there will be a website. However, the unthinkable has happened before, and 23andMe appears to have been somewhat negligent, so, just in case, what can we do? On your personal page at 23andMe, select the “Health Overview” option which will then display your elevated risks in each of 4 option categories..
For each of the 4 sections, Health Risks, Inherited Conditions, Traits and Drug Response, there is a blue link at the bottom that says “see all 122 risk reports,” for example. Click on the “see all” link and then simply print the results in each of the 4 categories. If you want to preserve any of the more detailed information in any of the categories, you’ll have to use screen shots. Regardless of what you do, or don’t, do with these results, they are yours. After downloading your file, you can simply save the results for later, you can upload them to donation based www.gedmatch.com (when GedMatch is again accepting files, currently estimated to be Dec.1) or you can transfer your file to Family Tree DNA to add your results to their data base and avail yourself of their matches and tools. Right now, the transfer price for either 23andMe or Ancestry files is only $49, which is significantly less than taking a new test at $99 (although the $99 test currently comes with a $100 restaurant.com giftcard.) This gives you the ability to find new matches with people who haven’t tested at 23andMe. 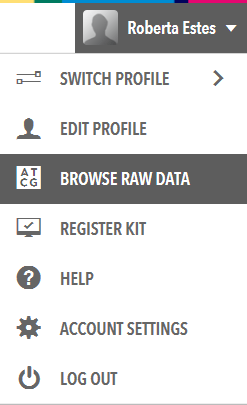 To download your raw data file at 23andMe, sign on to your account, then click on your name in the upper right hand corner of the screen, then on “Browse Raw Data,” then on “Download” in the upper right hand corner of the screen. You’ll then be prompted for your password again and the answer to your secret question. Default will be set to download all data. Leave it that way. You’ll then be asked if you want to open the file or save it. Save it. On a Windows PC, if you don’t direct otherwise, it will be saved in the Downloads directory with a file name where the word “genome_” preceeds the name of the person who tested. Mine is “genome_Roberta_Estes_Full_20131125XXXXXX. In the past month, 3 of the 5 files I’ve downloaded from 23andMe have been incomplete. I’ve been working with 23andMe for three very frustrating weeks now via e-mail to try to figure out why they are incomplete. So far, I have no answers and I’ve asked if these incomplete files have affected my (and my families) results posted at 23andMe. To date, I’m still getting their standard reply about not being responsible for third party upload sites, which of course is not the question I asked, at all. A normal 23andMe file will have about 950,000 rows on a spreadsheet, each one representing a single location tested. 23andMe confirmed this number last week. For example, I have 991,000 plus change and my niece has 960,000 plus change. All 3 of the incomplete files have only 574,515 lines each, exactly. And yes, all of them are build 37, and no, they did not test at the same time. I even downloaded them a second, third and fourth time, from different locations using different computers, etc. The files are simply massively incomplete. These incomplete files cannot be uploaded and utilized by other tools (www.gedmatch.com) or firms, including Family Tree DNA because 40% of the data is missing. Given this experience, the FDA’s concerns about accuracy have certainly given me pause to reflect…. You can get a good idea as to whether your file is complete or not by the zipped file size when it downloads. The zipped size of the incomplete files is around 5K (4901 to be exact) and the zipped size of the correct files is about 8K (8262 and 8013K to be exact). Good luck getting help if your file is incomplete. In order to contact the 23andMe customer service department, you have to jump through hoops, stand on your head, pat your stomach and rub your foot at the same time while chewing gum and blowing bubbles. Ok, tiny exaggeration. You really only have to click on “help” then use the “what’s your question” function, and then at the end of that exercize when you don’t receive the answer you need, you can submit a question to them via a form….but not until you go through that process. They’ll get back with you in about a week with a canned reply and then you can begin the back and forth dialogue, with 2-3 day intervals between each e-mail. If you haven’t contacted all of your matches already, now would be a wonderful time to send invitations. I send a message with each one that includes my e-mail address. Unfortunately, you are forced to utilize the in-house messaging system at 23andMe, so unless you’ve exchanged e-mail addresses with your matches, if the 23andMe system goes away, you have no way to contact anyone ever again. Obviously, this is for the same reason. Otherwise, your ability to communicate with your matches will disappear if the website does. Personally I far prefer e-mail rather than the messaging system anyway, so this is not a wasted opportunity. I want to say, again, that I don’t believe that anything horrible will happen to 23andMe. I don’t want to be an alarmist. They have deep pockets and lots of lawyers. They may get a slap on the hand, but in the long run, I think they’ll be around in one form or another, assuming, of course, that they can prove their results are accurate. I do have to ask myself why 23andMe has been unable to do this in 5 years. Was it just not a priority, corporate arrogance, or is there a real problem lurking? However, as for my data and results, better safe than sorry, and we should probably be taking these steps anyway. I’m glad I downloaded the data files for my family, because it has exposed a problem that I otherwise wouldn’t have known existed. Hopefully, I’ll still have time to get it resolved. This entry was posted in 23andMe, Regulation and tagged General Information by Roberta Estes. Bookmark the permalink. I would be very sad if 23andMe went away. I have enjoyed the contacts and the posts by other members. It immediately identified family members who tested in in order of closeness and identified them exactly as their relationship to me. The health information says that there is a probability you would have this disease. It identified one that I have been aware of for most of my life. Nothing beyond that can be done without the assistance or directive of a physician…no medicine, tests or treatment. I successfully uploaded my UNZIPPED file to GEDCOM and to FTDNA quickly and with no problems. If other matches had done the same, they appeared on these websites. I have no idea why the FDA would even be interested in this website. What’s next? Ancestry.com? …..and where does Ancestry.com fit in here…if you get my drift. I was amazed to hear on our local Houston station about 23&Me’s moment of shame, although I’d already heard the news earlier in the day. Thanks for the well written (as usual) “how to” and taking the time to care about all the rest of us. It’s troublin’ times we live in…what’s one more absurd inconvenience…hey, matey?! Ya gotta laugh! 🙂 Love you, Roberta. Hi Brownie, Ancestry.Com is offering DNA Tests. That is how it fits. Neither Family Tree DNA nor Ancestry are including any medical anything with their genealogy tests, so neither of them are affected by the FDA letter to 23andMe. I apologize for, “getting off subject”. I didn’t realize this discussion was limited to medical information. I have not read the FDA’s objection. I was under the impression from what I was reading that the accuracy of the tests was being challenged also. It is hard for me to separate analyzing the chromosomes of the cell nuclear which contains the genetic code and transmits the heredity pattern from medical science. I think I have happened into the wrong blog. No, this discussion isn’t limited to medical information. However, the issue the FDA had with 23andMe is entirely related to their reporting, interpretation and accuracy of medically related information. Unfortunately, for genetic genealogists, they also report cousin matches which many people use extensively. So at 23andMe this is very intermixed because they offer both sides of the coin from one test. Neither of the other two companies offering this type of service offer the medical aspect. The Family Tree DNA transfer price is now $49, not $69 as initially reported in this article. The new price is now reflected correctly. To restate the obvious, dueling with the Feds is monstrously expensive, eating up both resources and concentration on anything else. If what the FDA claims is true, they were shortsighted in not facing up to the requests, charges, etc. If not, it’s another case of ordinary (relatively ordinary, anyway) citizens being unable to resist the onslaught of generously funded bureaucracies. Roberta….add another step. Ask your matches to transfer to Family Tree DNA for the sale price of $49 (good until Dec 31) so good service can continue with viewing their matching segments on a browser. Good advice, I did two of mine last night at 9.19PM AEST and had results for both transfers at 2.00PM AEST TODAY! Less than 24 hours 😀 Last time I transferred my own kit and it took 6 weeks. And what’s better, FTDNA has triangulate built in. I’m with cousin Brownie (although like Derrell, we have yet to determine how we are kin! LOL). Also, I’d like to add the link to the whitehouse.gov website petition supporting our consumer right to know and letting the government know that there are a large segment of the population here who support the availability of these types of tests for consumers. We aren’t as dumb as they’d like to think we all are! I agree Lisa. It’s slightly ironic when most western countries are struggling with the rising cost of health care to prevent people from taking some responsibility/cost for their own health assessment. Last week the Australian Medical Association has reported a doubling of women with a risk/family history of breast cancer seeking testing. Unfortunately a lack of Australian government funding available for testing means many of these women will have to wait for testing. The lost time could be hugely detrimental to their health. This is only one example of a genetic health issue. There are many hereditary diseases. It should be pointed out encouraging people to transfer results to FTDNA does not help people who are researching the genetic health of their families. It is only of benefit to people interested in genealogy and does not ‘protect’ their results. FTDNA is currently running its holiday sale and the third party upload (your 23andMe match results or Ancestry.com results) is presently $49.00, not $69.00. The upload can be purchased from FTDNA now, to upload your 23andMe data later if you are still waiting for your 23andMe results. The FTDNA sale ends December 31. As I try to determine the best course of action – and thanks for all this great advice today- DNAGedcom.com would not let me access 23andMe download today and I could not access gedmatch.com either. Family Tree was operational. However, do these sites upload the health data or just the genealogical data? My husband and I are part of the National Genome project, and we also did Ancestry quite a while back, but we did 23andMe for the entire family and while I also do not think 23and Me will go away it is a risk. I don’t want to lose this medical information, or the contacts (although very few have responded). No, no third party sites download any health information. For that, I did screen shots but control P might print them in a readable fashion. I understand there is a way for MAC users to do pdf files. Someone posted that as a comment. Thanks for the clarification Roberta, and I did see the other posts on copying/pdf etc and have started that. Really appreciate the effort and all the help everyone is putting into this. Oops! The price changed while I was writing my reply! Thanks for correcting! 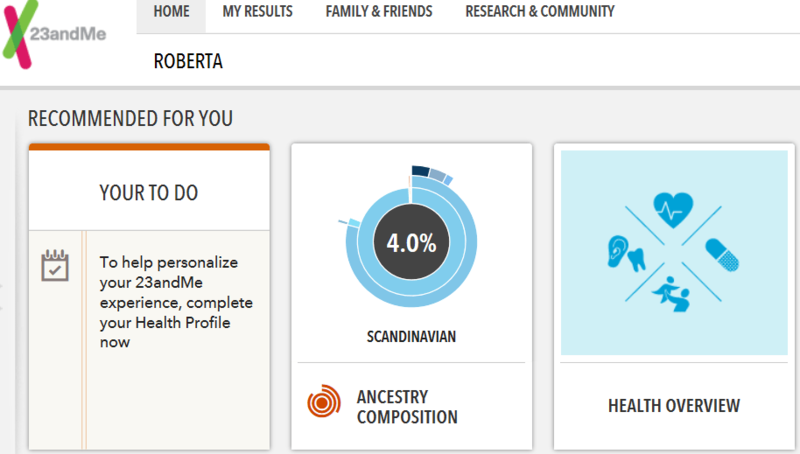 Also, I think you or a relative matches me on FTDNA? Thank you! I have about a dozen family accounts on 23andMe.com….I just took your advice and downloaded all the raw data from each account. Each one showed about 8.2 mg. so they must have all the information (I hope). Now, if I want to send this info to FTDNA (for a few who do not already have an account with FTDNA, do I do that through FTDNA? Also, since a few of this group have been tested by 23andMe, FTDNA and Ancestry. If someone has already been tested by FTDNA, would it help to send the 23andMe information also (and pay for the transfer)? You can purchase the transfer on the FTDNA web page. No, there is no reason to transfer the results of anyone who has tested at FTDNA. Certainly an aside, but I wonder if your 2 kits with under 600,000 were somehow tested on the new smaller chip? The three kits should not have been. They were tested at widely different times, but they are all build 7 now. 23andMe said that the number of SNPs should be about 950,000. Even the new V4 chip they are looking at moving to is only 200,000 smaller, not 400,000. Hopefully they will figure this out. Family Tree DNA cannot take these files and I want my data at FTDNA. I also want to know if what is missing affected my results at 23andMe. If you want to send me a message about this, I will forward it on – unless you think you have it worked out now. As far as the number of SNPs on v4, where did you get the information that it is only 200k less? This is not worked out. I will e-mail you. I’m sure they are quite busy right now, but I haven’t heard from them since last week. Another way to save your health reports (or any webpage) at least on a Mac, is as a .pdf. I don’t know if there is a similar function on Windows. With the page you want to save open, choose File/Print. The resulting screen for the printing setup should have a button, usually in the lower left, that says “PDF,” with a down arrowhead (for a drop menu). The selections include “Save as PDF.” Save what you want as .pdf, and then you can print any time. You can also choose “Preview,” which will let you see how it will look as a .pdf, before actually saving. Changing some of the printer settings may allow some things like no background, adding page numbers or URL, etc. to the pages, depending upon how the browser handles print setup. I have saved all my reports this way, but am going to do it again in case there were any changes since my original test results. No, not offended at all. Quite the opposite. I write these as an educational tool for all and I’m glad for them to be used in that capacity. Could this be a good ‘excuse’ ? to reach out again to those brilliantly close but non-communicating 23 and Me matches once more? ‘With the potential closure of the site I feel I must write to say..GET IN TOUCH’! 🙂 Or words to that effect. Suggestions on the best wording to get facilitate a response gratefully received. Even “bright minds” with deep pockets can get distracted. I received an email on Nov. 20th, just a few days ago, that 23andMe had received my sample. I wonder if my sample will ever be analyzed. I expect that it will be. They won’t shut the doors unless they are forced to, and you can be sure they will do everything to forestay that outcome. Just in case, it is a good idea to also purchase the third party upload from FTDNA (upload of your 23andMe results to FTDNA) which is on sale now through Dec. 31 for 49.00. On one of the DNA groups I am on, I saw posts that some people who uploaded their Ancestry or 23andMe match results to FTDNA, received their upload results in as little as 24 hours. As I understand this, the FDA has a problem with how the product is being *marketed*, and there is no real threat of 23andMe being shut down completely. It seems that many of the major media outlets are overstating the magnitude of the issue to some extent. I suppose this could sink the company if they’re forced to focus on ancestry and that subsequently ruins them financially or derails their interest in continuing the enterprise, but if Ancestry and FTDNA can stay afloat on genealogy alone, surely 23andMe hobble along even if they’re forced to roll back their emphasis on health. When the FDA says “marketed” it does not just refer to advertising, but also to sales of the product, so the threat is real. Unfortunately, I don’t think 23andMe has any interest in becoming a genealogy DNA company, so if they cannot offer health-related genetic data, I don’t think they will continue. That’s not to say, that I think they will be forced to cease business, but the seriousness of their situation should not be underestimated either. Thanks for all the information. I’d wondered how to save my info. I uploaded my data to gedmatch over a year ago so maybe that part is ok. I will print out the others things. Don’t forget that https://www.DNAGedcom.com allows you to download a lot of data very quickly. I’ll see what I can do to quickly increase what it can download. You can save your info to .pdf if you use Google Chrome browser as well – just Ctrl-P, then select PDF and click save, save to whatever file you like. Hi guys, You can easily and securely save all your 23andMe data, including genome raw data, using a FREE iphone/iPad app named SaveMy23 developed by a Biotech mobile software startup named “Portable Genomics”. See http://savemy23.com. Bruno. I have not tried this. If anyone does, let us know. It works and it is a serious company. Can someone update this article for 2016. This was made in 2013, not long ago, but since the website has gone threw UI changes since then, the ‘blue link’ that the first part mentions is not there, so I don’t know what/how to do this backup. Thank you! Unfortunately, 23andMe has been in the middle of a transition for nearly a year now. Half of their accounts are updated to a newer user interface and half are not. Both halves work differently and don’t communicate well with each other. So, unfortunately, until they are finally done, I really can’t update the article. I’m sorry.